Ft (1000 CBM)Fragrance Machine With 500ml Bottle, One Spare Valves, Safe Lock, Mount On Wall, Flexible Work Set For Any Time From Monday To Sunday, Home fragrance System For Hotel SPA Black color. 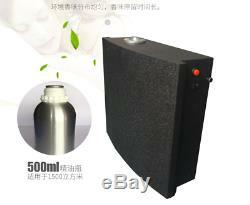 Fragrance Full of Your Body: This Machine will make you find Good feeling at home. Smell flies to your body silently and fluently, just like the nature stay with you anytime. Flexible Work Time: One day, when you drink coffee, one idea comes to your mind"machine works all the days, however our store does not open at weekend, if it still work, it will waste much oil, it is not favorable because oil is expensive ". At this time, you checked handbook and known it can be set up Any work time from monday to sunday. So convenient not not to wast much oil like before. And enjoy coffee with your family. Long Lasting: The timer means you can ADJUST INTENSITY of the essential oil to how you like it. The diffuser is portable, affordable and good for anti-insomnia, memory power. High Efficient: This aromatic diffuser can cover up to 6,300-6,900 sq. It is affordable, long lasting, 100 % SATISFACTION guaranteed, professional grade and gives you an easier breathe. Just plug in the power cord in the machine and enjoy your favorite smell. Use Oil Directly: Our machine can use Essential Oil directly, and does not need to add water. 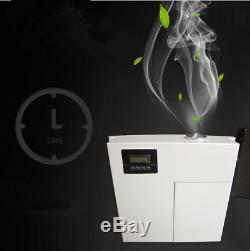 Our Aroma Machine works with Essential Oil with base directly, and. Once oil use up, you can refill it by yourselves. 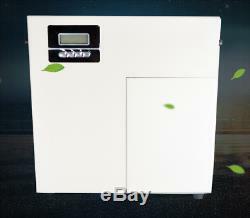 At the same time, machine can set up Flexible time to control time and frequency of spread fragrance. 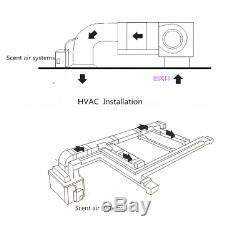 There are flexible usage methods, you can put it on table/floor or connect to HVAC system. If you are owner of Hotel, SPA, flagship store. This machine will make your room full of fragrance in short time. <1>Coverage Area:6,300-6,900 sq. <7>Flexible Work Time: all time from monday to sunday. <8>Working place:Hotel/Restaurant/Office/Public places/Building ect. Step 1: Add Oil into bottle. Step 3: Set up your local time Step 4: Set up work time you want. How To Set Up Time For Machine. 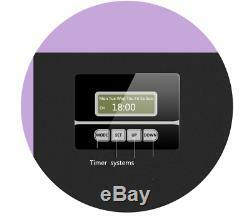 For each machine, it needs to set up your local time, and then set up working time you want. Only when your local time is within working time, machine will work. There are 4 Events on led display, it is composed by 4parts For example: Event 1 on, event 1 Off, Continuous working time. Countinouse Working Time: 60 Seconds. And continuously works 60 seconds and pause 30 seconds. So it will work after 2 Hours. 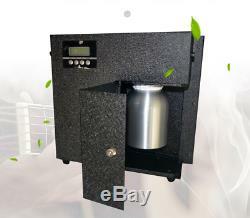 Is a professional standalone scent dispersing systems for large areas. Nearly any scent can be diffused into the environment through a moicro-nebulization pross. The pure fragrance or flavor is diffused without being heated. In order to avoid any negative impact one the complexity and quality of the scent. The system transfers the fragrance /flavor from liquid phase into the gas within itself. So risks of contamination of HAVC are avoided. 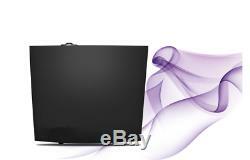 Complete transfer of liquid into scented air within the system dry scenting. No contamination of air ducts. Attached to the air duct with by pass. Enhances the ambient atmosphere in shops, hotels, lobbies. Clubs , restaurants , malls , casinos , saps, supermarkets , gyms. Fragrance for the scent machine. We use essential oil as refill for our device, of course you also can use your own fragrance, however it is better to be oil based liquid. The item "6,300-6,900 sq. 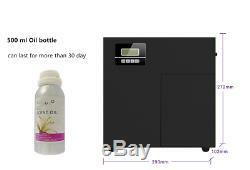 Ft Fragrance Machine With 500ml Bottle Hotel fragrance System" is in sale since Saturday, May 5, 2018. This item is in the category "Home & Garden\Home Décor\Home Fragrances\Essential Oils & Diffusers". 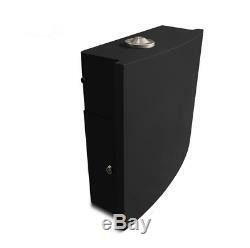 The seller is "ruiym0" and is located in , . This item can be shipped to North, South, or Latin America, all countries in Europe, all countries in continental Asia, Australia.